April 24, 2015 – Three Fort Valley State University students and two professors traveled to Sunshine State recently for a scientific conference from a professional organization. 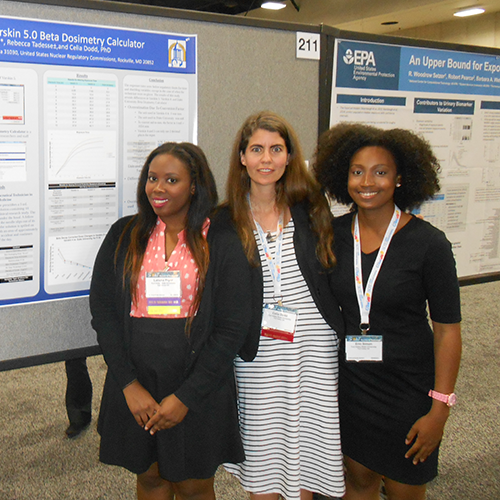 Junior plant science biotechnology major Madalyn Bryant, and two senior biology students Erin Simon and Latisha Pryor, and assistant professors of biology, Dr. Celia Dodd and Dr. Felicia Jefferson, attended the 54th Annual Society of Toxicology Conference in San Diego, Calif. in March. Pryor won two awards at the conference. The Society of Toxicology is a professional and scholarly scientific organization of scientists from academia, the government, and industry that represent scientists that practice toxicology in the U.S. and abroad. “The SOT (Society of Toxicology) is a pretty significant conference in the field of toxicology,” said Dodd, who has attended the toxicology conference for the past seven years. The assistant professor of biology, who is the secretary for the Southeastern Society of Toxicology, has taken students to the conference for the last three years. The 2015 conference was the first where FVSU students actually presented. Dodd’s specialty is neurotoxicology. She is currently researching the effects of flame retardants, specifically Polybrominated Diphenyl Ether-47, or PBDEs. These flame retardant compounds are added to manufactured materials that include building materials, electronics, furnishings, motor vehicles, and textiles to slow the spread of fires. Two students presented research conducted last summer. Latisha Pryor and Dodd presented a research paper entitled, “An Analysis of Varskin 5.0 Radiation Dosimetry Software.” Based on Pryor’s research completed as an intern at the Nuclear Regulatory Commision in Washington, D.C. Senior Erin Simon and the assistant professor presented research paper “Developmental Neurotoxicity of Polybrominated Diphenyl Ether-47 in Caenorhabditis elegans.” This research was completed in the FVSU Department of Biology and studied toxic effects of PBDEs in the biological nematode model. Pryor, a student in the university’s Cooperative Developmental Energy Program, won big at the conference. She was one of 14 recipients that won the SOT Pfizer travel award, an all expense-paid travel award sponsored by Pfzizer pharmaceuticals. She also won a 2015 Perry J. Gehring Diversity Student Travel Award, named after a distinguished toxicologist that served as past president of the SOT. The award given to students from under-represented group in toxicology (African-Americans, Hispanics, or Pacific Islanders) to assist their participation in the annual meeting of the Society of Toxicology. Pryor was the only student to win this award. Pryor said the conference was an enlightening experience. Bryant, a junior student, received a travel award from the SOT to attend the conference, and Simon received a special grant from the university’s Undergraduate Research Program to attend the conference. For details, contact Dodd at (478) 825-6494.